True Wild Life | Birds Of Paradise | The birds of paradise are a group of birds that are found in the tropical rainforests of south east Asia, mainly in the jungles of Indonesia, Papua New Guinea and parts of eastern Australia. Birds of paradise are best known for the beautiful array of feathers which are existent on the male birds of paradise, which the male bird of paradise uses to attract the attention of the surrounding female birds of paradise. As with many species of bird, the female birds of paradise are dull looking in comparison to their male counterparts and are generally smaller and have light brown feathers, and have a similar appearance to the nightingale. 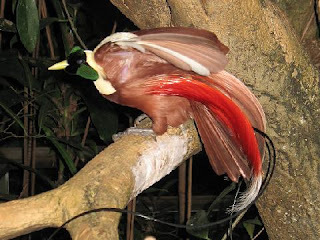 There are around 50 different birds of paradise species that range in size from 15cm to over a meter in height. Many of the birds of paradise species are extremely rare and are only found in particular habitats and in certain places. The birds of paradise were unknown to the western world until 1996 when David Attenborough stunned the world with his footage of the incredible birds whilst on a trip to Papua New Guinea. 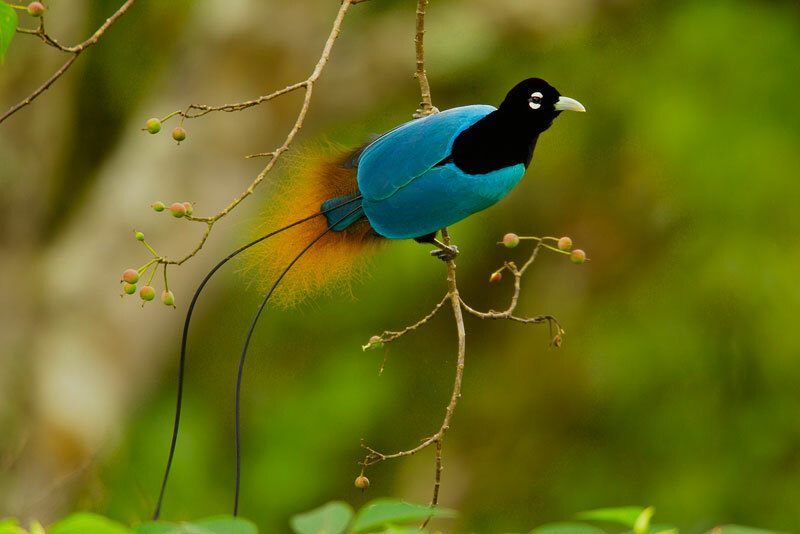 Many birds of paradise species feed on fruits and berries found in the canopy of the surrounding jungle. Some species however, are very partial to eating insects and other birds of paradise favour particular species of spider. 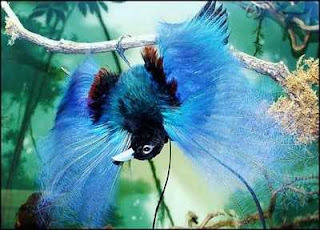 Birds of paradise are known to be the most dramatic and attractive birds in the world. The brightly coloured plumage of the male birds of paradise contains colours ranging from red, to yellow, to green and along with their unique dance moves, the male birds of paradise really stand out on the forest floor. 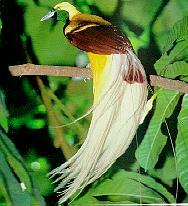 The beautiful, bright colours of the birds of paradise have made these birds a highly prized target for hunters and tribesman alike who use the brightly coloured feathers of the birds of paradise to create clothes and costumes. This practice and tradition has meant for enormous population declines for the birds of paradise, with some species being worse off than others. Birds of paradise tend to be solitary birds and only come together to mate. 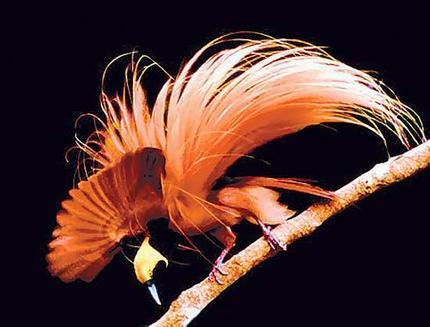 The male bird of paradise attracts a female bird of paradise using his bright feathers and perfected dance routine. The female bird of paradise lays her eggs in a nest. Unlike many other species of bird, the birds of paradise can nest on ground level, in the trees or in dense foliage. Birds of paradise chicks usually hatch within 20 days but the specific incubation period differs between species. The birds of paradise chicks are often born with no feathers at all although some hatchings are born with a few. The newly born birds of paradise chicks are unable to walk or stand and rely on the mother bird of paradise to find food. Birds of paradise chicks are usually independent by the time they are a month old. The madness of human greed and the disconnect with our great ancestors is a cosmic tragedy we will soon understand. The forces of fascism, zealotry and human population explosion have delivered us to the abyss. Only the creator of worlds and brave warriors of wisdom can make the song start again. I weep,. I weep . I weep. Reach out touching faint sensation. Only sparks of dreams come to me now. Fast water swirling like great herds among the roots. Immerse in libation Fill your ear drums. Our birth is still some time away. labor of our arrival not yet stirring. Pulsing for the slightest hope. Sing again and weep no more. i need more birds in my life!!! Those brids are so pretty!!!!!!!!!!!!!!!!!!!!!!!!!!!!!!!!!!!!!!!!!!!!!!!!!!!!!!!!!!!!!!!!!!!!!!!!!!!!!!!!!!!!!!!!!!!!!!!!!!!!!!!!!!!!!!!!!!!!!!!!!!!!!!!! !